Join Me for a FREE Creativity Training Webinar. GET the Instant Replay NOW! 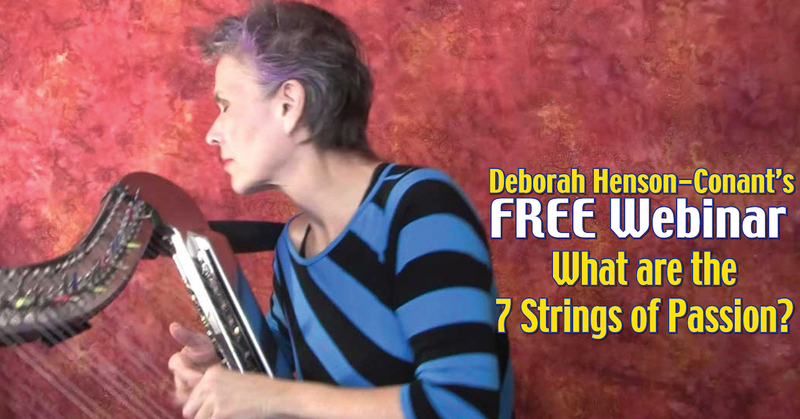 In this FREE Play-along WEBINAR you’ll learn the 7 Strings of Passion and how they enrich your life and your creative expression in every creative act you do. In this webinar you’ll learn the 7 strings of passion that inform all creative expression: Impulse, Structure, Character, Roles, Practice, Deconstruction and Lift-off and how you can add their resonance to your life. You’ll learn the difference between practicing to get something ‘right’ – and developing a daily creative practice that that enriches you, starting from where you are right now. You’ll learn the difference between imposing external constraints – and using internal structures that help you bloom with an infinite number of creative expressions. You’ll learn how using these principles creates a mirrored resonance. If you’re a harpist that means that there’s an inner instrument resonating just like the instrument you play. As you develop the resonance between your inner and outer instruments you create a richer and richer life resonance of creative expression. This may sound mystical – but it’s deeply practical – and you can apply it to any act of creative expression. REGISTERING FOR THIS WEBINAR includes membership in my mailing list. If you want to unsubscribe later, it’s easy. Though I think you’ll find the weekly newsletter is fun.